I’ve had the privilege to get to know Lisa Leonard through writing for (in)courage. Not only is she an amazing designer, but her heart for others is precious. She is one of the sweetest ladies in the blogosphere, and my real life time with her was not enough. I had an evening to hear her story and it’s inspiring. Sitting in my blog drafts is a post I started on the spirit of entrepreneurship, with a follow up post specifically about women who have taken that spirit and created their own businesses and/or work from home. Lisa is one of those I mention because five years ago she began her own business, and now it supports twenty others. I LOVE supporting mompreuneurs, and aside from having this amazing giveaway to bless you, I hope you consider purchasing one of her handcrafted designs for your Christmas gift giving. I love supporting moms and families when ever I can. Her jewelry is not only handmade, but it’s unique and meaningful. Many of her designs were created through her family’s personal journey and her heart comes out in each creation. If you haven’t had the privilege of browsing Lisa’s site (and personal blog), you are in for some eye candy. Five blessed winners will receive a $50 Gift Card to shop for some Lisa Leonard goodies. This giveaway was sponsored by Lisa Leonard Designs as part of Win Giveaways Holiday Bash. Read more on my disclosure policy. Terms for this giveaway are located on the Win Giveaways Facebook page. I have long admired her Family Tree necklace– I think that is what I would choose. I love the key to my heart necklace and the itty bitty hearts necklace!! I would pick the heartstrings necklace. I LOVE!!!!!!!!!!! it!!!!! I would totally get the “Through My Lens necklace!!! I love the “leaf” ornament – it’s beautiful. Kind of had my eye on the Leather Cuff too! I love the “whoo do you love” necklace! Would love to win the gift certificate! I would love to have the family tree or heartstrings necklace. These are so beautiful! I would get the one pictured. Dream God sized dreams!! What a tough decision! I think my favorite is the Together Necklace. I’ve had my eye on the teenie tiny initials necklace for the longest time!! This jewelry is so beautiful. I love the Be Still necklace- one of my favorite bible verses! I would get the Circle of Love necklace. What a generous giveaway. As hard as it is to choose, because of my boys, I keep being drawn to the skinny tag necklace. I would need four of those tags but really like the more masculine look. That pearl though gives this mama her feminine touch. Which you need in a house o’ boys. How does one choose…there are so many. If I had to choose right now it would be the be still necklace. But have a few others I’d like as well. I’ve had my eye on You’re the cream in my coffee. Follow you on Twitter and sent out a Tweet. Facebook fan of yours – thanks so much for the give away! Oh my everythign is beautiful! But I adore the Hope is the thing necklace! I would choose the grow roots, sprout wings necklace for my oldest son’s teacher. She is inspiring in so many ways that I think this fits her perfectly. Wow, her stuff is gorgeous! I would choose the heartsrings necklace. I would get one of the memory necklaces in memory of my Mom who went to be with the Lord in Sept. 2009. I love her Daisy Chain Bracelet. Family tree necklace.. gotta be because I have 4 children. I’m subscribed thru RSS Reader. I’ve loved her jewelry for a long time. Since I actually already own one that my mom and sister bought me, I’d have to buy my sister the laundry line necklace with all of her 7 kiddos on it. I’m a FB friend already. I love the oval monogram necklace. I would get the hugs and kisses necklace. I would get the thin sterling cuff! I would give the card to my wife and let her pick something out. I follow both of you on twitter and I tweeted about the giveaway. It would be so hard to choose! I love the Family Crest Necklace though….. I would get her Forever heart necklace. I lost my husband two weeks ago and I would have his name and mine stamped on the other side. Even though he is gone from this earth, he is not gone from my heart. Hard to pick just one, but the necklace that simply states “LOVED” is my favorite. It would go to my daughter…. Jumble of Charms necklace but all her stuff is so cute! thanks for the chance to win one of these beautiful pieces! I love the wall hanging and little birdie earrings. Wow – her designs are fantastic!! I have a friend who is struggling with cancer right now and things aren’t going well. I think I’d get the ‘you are loved’ necklace or the single tag necklace with ‘Jesus’ on it for her to wear to remind her how much her Father loves her. Thanks for the chance to win one! I would get the sterling ring. I am a friend of your Balancing Beauty and Bedlam Facebook Fan page! I’m in love with the Family Tree necklace. Thanks for the opportunity to win. I like the sweetheart tree. Oh my goodness, these are beautiful!! i think I would chose the “hope is the thing” necklace. I love that quote and the necklace is gorgeous. I subscribe to your blog via GoogleReader. Thanks for the opportunity to win. I LOVE the Dream God sized dreams bracelet! Wow, her stuff is gorgeous! I would love to win this! I liked a lot of them, but especially the Sweet and Simple birdie necklace. I like the bold love necklace and love the Christmas decorations! I would pick the Heartstrings necklace!! Thanks for the giveaway. I would get “I hold your heart in mine” because it reminds me of my beautiful daughter, the joy of my life! I love the “You’re the cream in my coffee” necklace!! I like the daisy chain bracelet but would probably browse for hours before deciding for sure. The Paper Lanterns necklace is adorable! I like the whoo do you love ? necklace with the owl 🙂 Thanks for the giveaway! My favorite of hers has always been the Family tree necklace. Everything is gorgeous on her site! Beautiful work! My mom LOVES SNOW so the Snowflake ornament would be awesome! I would get the “you’re the cream to my coffe” necklace. My hubby is an archivist and historian – I think the family tree key chain would be a great way to spend the gift card! He would love it, but never buy something like that for himself. Your e-mails are making it to my inbox regularly! I love the Family Tree necklace! It is on my Christmas wish list! Thanks. I’d pick the Open Circle Bracelet…..beautiful! I love the captured heart necklace! I like the thin cuff w/ the names on it. I love the daisy love chain. If I won, I would get this bracelet for my sister and have her triplet girls names on it. It would be especially dear as she lost one of the girls shortly after birth. I”m your friend on FB. I love her Family Tree necklace. love the vintage frames necklace…great giveaway! I really like the family tree necklace so I’d probably go with that one! I LOVE the snowflake ornament. We do our entire tree in snowflakes and snowmen so this would be a perfect fit. I love the family tree charmed necklace. Everything is so beautiful. I’d like to buy her leather cuff as a gift for my brother. I receive your posts via google reader. I would want the Family Crest or some of the Snowflake ornaments. I follow you on FB. Love you jewelry, so beautiful! I love the daisy chain bracelet!! Everything is so cute, I could spend a fortune. I love the “through the lens” necklace. I love the small open circle necklace, the “through the lens” necklace, and the ring! Ooooh, tough choice! Either the teeny tiny initial necklace or baby’s first spoon. I love the Grow Roots, Sprout Wings necklace! The Brave Love neclace is beautiful – though it’s hard to choose my favorite!! I just LOVE the family tree necklace. It’s beautiful! I’d love to win the family tree necklace – it is so beautiful! I want her leather cuff bracelet – love it. I love the forever necklace – the organic shape of the heart, really works for me! All of her designs are awesome, that’s the first one I’d get. There are so many amazing pieces of jewelry, however I LOVE the “my heart” necklace! I love the cream in my coffee & tiny initials necklaces! I love all of her stuff!! I think the Mama necklace is beautiful. I love the family tree necklace! it’s gorgeous! Many of them are though, thanks! i love, love, love the Be Still necklace!! Wow… I’ve never seen your jewerly before… totally awesome… I’m making me a wish list… please enter me for the contest! I would get the tiny squares necklace! So hard to choose they are all beautiful. Any of the mothers necklaces to out my 3 kids manes on. I like the key to my heart necklace. I love her Together necklace! I’ve loved the family tree since seeing it in a Parents magazine!! I really like the heartstrings. Such a tough choice! I’ve always liked the open circle necklace so I’d use the gift certificate toward that. I love the family tree keychain! I love the circle necklace. I would have to get the Hope i s the thing necklace. Would make a perfect gift for my mom! I like the Crystal Drop Earrings. I would put the $50 toward the daisy bracelet. Absolutely gorgeous! I have always wanted the sterling ring. It is so simple and unique at the same time. I’m already a Facebook friend. I love the itty bitty hearts necklace. It’s perfect! I would engrave each heart with my sons’ initial. K for Kyle and B for Blake. I would get the one pictures- I love it- Dream God Sized Dreams!! I follow you on twitter and am getting ready to do your tweet. …AND we’re “friends” on FB! I can’t decide what I would like. I do like the Bracelet you have in the top picture!! I follow you and Lisa on Twitter! I’m subscribed to you in a reader! I also “liked” you on FB! i love her jewelry. it’s all beautiful. i especially like the “you are loved” necklace. I would choose the family tree necklace. I LOVE the daisy chain bracelet! I would pick the freshwater pearl earrings and the crystal drop earrings…they are beautiful. Family Tree….it’s always the Family Tree necklace. I like the Be Still necklace. I have loved her stuff for awhile now. LOVE the tear drop necklace with the stone…so pretty! And, I already am a FB friend. I LOVE her jewelry. One of my favorites is the Open Circle necklace! I’d love the illuminate necklace. Hmmmm I think I’d get the Itty Bitty Hearts Necklace. I love Lisa’s jewelry!!! I adore the “Key to my heart necklace”, but I love her stuff and her blog. She seems AMAZING as an artist and person! I totally love the aqua stone necklace!!! LOVELY! So many beautiful choices, but I love the “captured heart” necklace. I would choose one of the mom’s necklaces… so hard to choose! I love the teeny tiny initial necklace – so cute!!! love the laundry line necklace! thanks for the chance!! I would love the daisy chain braclet or the mama necklace. Very cool jewlery!!! Will have to get some soon. What amazing hand-crafted jewelry! Thanks for the fun giveaway! I love her leaf ornament! Gorgeous. I follow you on Facebook! Thanks for a chance to win some beautiful jewelry! I “like” you on Facebook and follow your website on there. I would order two of the baby spoons for my twin grandsons who will be 10 weeks old on Thursday!!! I am FB friends with you also!! 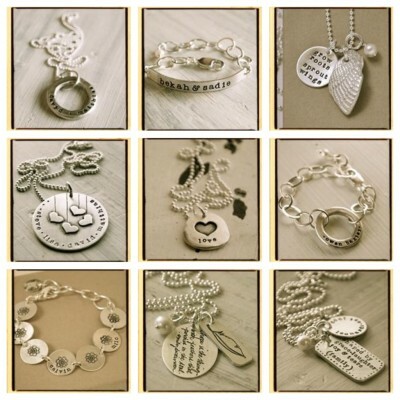 I would use the gift card toward the purchase of two of the little feet necklaces. My daughter just became a mother in June 2010 with the birth of her son and would love to have one of these necklaces. I’d also like to get one for my daughter-in-law who made me a first time grandmother in Sept. 2008. I love the key necklace! i love her hope is the thing necklace so much. I would get the dream bracelet or the loved necklace. LOVE the tiny squares necklace with names. Actually I love the entire Lisa L collection! Thanks for the chance to win! I’m a google reader follower! I love the ‘Heartstrings’ necklace but the “My Dad is A SuperHero!” keychain really caught my eye! I like the daisy chain bracelet. I would get the family tree keychain or the family tree necklace. Well it is either the Illuminate Necklace or the snowflake ornaments. I’d choose the Together Necklace. I follow BeautyandBedlam on Twitter and tweeted. I THINK I would get the Family Tree necklace. I THINK. It’s soooo hard to choose. I’m sure I would take at least 2 weeks looking…and enjoy every minute of it. 🙂 And really, if I think about it right now, what I would really like to do is give a necklace to my really good friend who is a little down right now. I think she’d love any of the necklaces with her boys’ name on it. I subscribe in an RSS reader. i would probably put a $50 gc toward the hope is the thing necklace…really fitting for what we are going through right now! i am currently signed up for your emails. already friends on FB…thanks for all your updates! I LOVE the Daisy Chain Bracelet. It is adorable! Well, it is impossible for me to pick one favorite, but some of the ones I love are the Heartstrings, Brave Love and Family Crest necklaces. Oh, what would I do with the $50…there are soooo many pretties to choose from, but the Sparkle necklace really speaks to me…also the cute Owl necklace that says “Whooo do you love?” So sweet! Oh, I love Lisa’s work. I keep dreaming I can get my own some day, but always end up spending our money on groceries and electricity and other such foolishness. I would choose the mama necklace or the family tree. Thanks for the chance to win! I would get the petite family crest! I like the lovebird necklace. Really, I like all of her designs…they’re so pretty! For $50 I would have to get the teeny tiny initials necklace because I have wanted one forever. I would get initials of each of my 5 boys and a pearl. Her jewelry is so beautiful! I love the “jumble of charms” necklace! I had a handstamped necklace and my 10 month old recently pulled it off my neck..hehe Would love to get another one! I love the Be Still necklace. Need that reminder at times. I also subscribed to your daily e-mails. I love the Who do you love necklace. That owl is so cute! I would get the Beautiful Necklace for my teen daughter. I like the tiny square necklace and the original necklace. I would spend a gift card on a teenie tiny initials necklace. Darling! What a great site, so many great things. I subscribe to your letter plus “like” you on facebook.. I would love to get her new ornament for my daughter this Christmas! I LOVE Lisa’s designs. I have “Be Still” and wear it almost every day. I’d be blessed to own any of her pieces, but right now I’m especially captured by “Grow Roots, Sprout Wings.” Simply beautiful! So many beautiful things–I would definitely want to add the bird necklace to my Lisa Leonard collection! I’d love to get the Brave Heart necklace, I love it! I would get the Family Tree necklace. I’m in love with the heartstrings necklace!!! I follow you on twitter- @VectorYou ! Sorry, forgot to leave my tweet link! I Would love to get anything of Lisa’s!! I might go for her snowflake ornament though, so pretty! I would love the Through My Lens necklace. I like the laundry line necklace. It’s very different. I really like the jumble of charms necklace! Wow !! What a creative site :=) Me like a lot, thanks for sharing lovely decorations and bakery, Ill be back for sure, great christmas to all of you !! Following both you and Lisa on Twitter…and “tweeted” about your give-a-way!!! Fitting with the season I’m a big fan of both the snowflake and leaf ornaments! I like the family tree necklace, like so many others. How exciting! I would choose the Family Tree necklace for my niece. I love the itty bitty hearts necklace. I would love to have the Daisy Chain Bracelet with each one of my kids names on it! WOW – what a treat for me – I hadn’t seen Lisa’s jewelry before so her website was a really nice “first” for me. I liked so many things but the Leaf Ornament is gorgeous so that would definitely be one of the first things I’d get. I LOVE all of her stuff….but would LOVE the itty bitty hearts necklace. We don’t buy gifts for the adults, so it would be nice to have a little something special for me. I’m a fan on FB; I would get the daisy chain bracelet. I would love the fly free necklace! My baby sister is getting married this summer so I would have the pewter heart engraved with her and her fiance’s wedding date for a present for them! My current fave of hers is the brave love necklace. It would make a perfect gift for my mom. I already subscribe to your blog through google reader. I love the sterling ring with names. Anything I can wear with my girls’ names on – I love. There is NOT ONE that I don’t love. Love the Family Tree series, love the “through my lens”, and the Open Circle sets… Awesome. I don’t know that I could decide. But, if I’m chosen, I’m sure I’m up for the challenge! Thanks for the giveaway fun! Would love the family tree necklace! love the family tree necklace and key chain.. I’ll have to think about it! Lovely giveaway! I would choose the Marked by Love necklace! I would pick the Heartstring Necklace. I liked the teenie tiny initials necklace! I love the “from up here” necklace with the little bird! That Daisy-Chain Bracelet is so cute! It reminds me of being little again! I love the “through my lens” necklace and the snowflake Christmas ornaments! I subscribe by email. I love all of her jewelry. It will be hard to pick a favorite but I know I would love trying! I like the teenie tiny initial necklace. Oh the “from up here” necklace is my favorite 🙂 So beautiful! It’s all so beautiful! We have 6 children and sometimes jokingly refer to them by number, so the numbered necklace would be fun. I follow your inspiring blog. I LOVE the Family Tree Necklace – definitely my choice! I would choose the teeny tiny initials necklace- everything is so beautiful, it’s hard to choose! Teeny Tiny Initials Necklace is beautiful! I would get the freshwater pearl earrings and the crystal drop earrings. I have one of her necklaces and my daughter has “coveted” it since I got it! I would get for her 22nd birthday (Dec. 26) the original necklace for her and her soon to be fiance. Very, very hard to decide! I like the Mama Necklace and the Cream-in-my Coffee necklace too! But my daughter would enjoy the “through my lens” necklace….. so many beautiful designs! I love the “you are the cream in my coffee” necklace. The snowflake ornament is cool too. What an awesome giveaway. Actually, I think I would give the certificate to a good friend going through a tough time right now. I think I would choose the sterling ring. I think. It would be very hard to choose! would like to get any of the necklaces!! so pretty! LOVE, LOVE, LOVE the family tree necklace, and the sterling silver rings! I LOVE her jewelry! Very Hard to decide. Hmmm…. maybe the Key to My Heart necklace or the Dewdrop necklace or the Cream in My Coffee necklace or, or, or…. I would get the Brave Love Necklace! It’s hard to decide what to get because they are all so unique, beautiful and full of potential meaning. I asked my hubby for a Lisa Lenorad for Christmas but I don’t think it made the cut, I would love this little gift for myself–thanks. I don’t know if you could beat the “Dream God-Sized Dreams” necklace. That’s awesome! I like the you are loved necklace. I like the tiny square necklace. Cute. So many nice things…difficult to choose. I think the Be Still necklace. These hand stamped pieces are all so beautiful; I can’t pick just one favorite. I have a few on my list: Be Still, Hope is the Thing, Wish, Sweet & Simple, Fly Free, and Whoo Do You Love. I’d be happy to have any of these. I subscribe to Beauty & Bedlam via e-mail. I am a FB fan of Beauty & Bedlam. I love the Captured Heart necklace. What a generous giveaway and wonderful designer. I love the “Hope is the Thing” necklace. What a message to share by wearing it. Also, love Dream, God sized dreams, awesome message too. The Basic Tag Bracelet is wonderful. Since my teen age years I have been fasicnated with ID tag necklaces and bracelets. Hers was beautiful. I like the bracelets and the ornaments. Love the “Brave Love” necklace – would get it for my Mom! I subscribe to your daily emails. I love the daisy chain bracelet! I would like to purchase the You Are Loved necklace. I follow you on twitter and tweeted about the giveaway. mammamagee. I love her stuff. It would be hard to decide, but I guess the fly free necklace…..What a great giveaway. everything is so nice. I really like the daisy chain bracelet and silver cuff. I’d love to get a Family Tree Necklace if I won. I love the Family Tree Necklace!!! I receive your e-mails. Love your blog!! I like the corner of my heart one. But there are a lot of really nice ones. I never win these things, but I have always wanted a bracelet or necklace with all five of my kids’ names on it. I would get the open circle necklace. We gave this to my SIL for her birthday this summer, and I would love to have one for me now! I also get your emails in my inbox each day : ) Thanks for your thoughts and ideas! It’s got to be the laundry line or your the cream in my coffee necklaces. I would buy the heartstrings necklace. woo pretty things.. I love the snowflake ornament or a keychain for my hubby! I would choose the teenie tiny initials necklace – I’ve wanted that for a while now! I love their Daisy Charm Bracelet! LOVE!!! I wouls choose the Teenie Tiny initials necklace. They’re all beautiful, but I love the Fly Free necklace. The Daisy Chain bracelet-so adorable! I would get the creamwater fresh pearl earrings. I followed you on twitter and tweeted giv. @joycemlinek. I follow on fb and shared with friends. Everything is beautiful. I would really have to take the time to figure out which one would hold all the names (or initials) of my Aunts 9 children to give her something special. I like the family tree but, not sure they would fit! I am a simple girl and love her freshwater cream pearl earrings and the adorable snowflake ornaments! Captured Hearts, I think.. but it’s very hard to choose! I also recieve daily emails! I’d get the jumble of charms necklace. I love the heartstrings necklace. I’d choose the together necklace if I won – it’s fantastic! I would get the aqua stone necklace! I think that I would get the open circle necklace. Captured heart necklace or daisy chain braclet. That would be a hard choice, love them both! The brave love necklace is special. I would get the “from up here” necklace. Very nice. It would be hard to pick only one, but the family tree is high on the list. I would get the Jumble of Charms necklace and have it personalized with my daughters as well as my wedding anniversary and husband. Love Lisa Leonard jewelry! Hope I win! I would get the Whoo do you love necklace – I have a sick obsession with owls. I’ve always loved the friendship necklace, but the every corner of my heart one is my new favorite. Beautiful all! I would get the ‘marked by love’ necklace. They’re all so pretty! The “Family Tree” necklace is awesome! So beautiful! What an amazing giveaway! Thanks so much for your incredible generosity. Blessings to you and yours this Holiday season, M.
I am a devout FB follower! 🙂 Thanks, M.
I love the aqua stone necklace, and also the one pictured here! I love the hearts necklace with names around it. I would get the teenie tiny initials necklace, and buy enough extra discs to put each of my ten grandchildrens first initials on it! I’ve been eyeing her store for a long time! If I won a gift card I’d definitely get the key to my heart necklace. It’s out of my price range, so I’ve chosen a few other necklaces I like, but I’m holding out hoping that key to my heart will go on sale or I’d “run into some money.” I would add charms for my children, but my have my husband’s name on the key to my heart….Oh it’d be perfect! I would get the Be Still necklace – great reminder during this busy season! I’ve been wanting her Grow Roots, Spread Wings necklace! I would love the sterling ring! I really love hope is the thing necklace…..but heartstrings and hold your heart in mine are touching too! I’ve’ loved the Be Still necklace for a long time, and would love to win it as a reminder to be still and know Who is God. I’ve loved the Be Still necklace for a long time, and would love to win it as a reminder to be still and know Who is God. I already follow you in my Google reader!! My daughter would love the petite original necklace. i follow you on facebook and subscribe to email!! i love everything! can i get one of each? i’m loving the brave love and family crest right now. i follow lisa on twitter and tweeted! I love the ‘from up here’ necklace. Beautiful. And I ‘like’ your Facebook page! I have one of her necklaces and just love it! If I could get another I would choose the Open Circle Necklace. It is just such a simplistic design- I just love it! oh my lands! I JUST discovered Lisa Leonard and am completely in love with her stuff!! As a photographer, her “through my lens” has just captured my heart completely (amongst a dozen other pieces). I just love it!!! So many to choose from, but I would probably buy the Little Feet necklace for my daughter. Subscribed via email. Honey, I wanna win a gift card!! I subscribe via google reader. I LOVE Lisa Leonard jewelry!!! If I won one of the gift certificates, I would purchase the heartstrings necklace only with 6 hearts and the words “happy, healthy & together”. Whenever we’re short on money my husband reminds me that he never asked God for riches, he just asked that we’d be happy healthy and together – what an amazing reminder that would be!! Wow…thanks for the opportunity. Probably would look at the Be Still necklace. And I subscribe to your feed. I LOVE the Dewdrops necklace!!!! Would be SO excited to win! I’m also excited because I think my hubby is getting me one of Lisa’s other necklaces for Christmas…I can’t wait! 🙂 I’ve been eyeing them for awhile. Thanks for the giveaway. I would get the snowflake ornament and crystal drop earrings! I love the “be still” necklace. Been wishing for one of her necklaces for years! I think I would do one of the key rings, or maybe a leather band for my husband. I love Lisa Leonard!! It is hard to choose a favorite…maybe the Family Tree or Jumble of charms necklaces (hard to find one that all five of our kids names fit on :). Thanks for this fun giveaway! I receive FB updates :). I receive email updates :). I subscribe to your email. Your blog is one of my must reads! I would get the teenie tiny initials necklace. i want the be still necklace! I love the teeny tiny initials necklace! I subscribe to your blog in my reader. Thanks! I love the family tree necklace!!!! I like the petite original necklace. I think it would make a great gift for my daughter. Welcome to my FB list. I’m fan. I follow you by email….and am loving it. I love bracelets, I like the necklace and the feather charm….but I really like the ring too. I love the Through my Lens necklace……..I am a children and family photographer and I have not seen anything like this one!! Hopefully i am the lucky winner! I love the ‘petite original necklace’! I would love to win the Family Tree Necklace. The heart necklace. I subscribe by email. I have a necklace from Lisa and love it. I’d love to give one to my mom for Christmas! Thank you for hosting this giveaway! I think my favorite are the freshwater pearl earrings. Would love the heartstring necklace! I like the snow flake ornament. I liked the mama necklace. I would definitely get the baby’s first spoon and the pewter heart! I would get the pewter heart wall hanging for my friend who just got married and the baby’s first spoons for my other best friend who just had a beautiful baby girl. I subscribe to your blog via Google Reader and would love a Lisa Leonard necklace! Her work is wonderful! I love the cream freshwater pearl necklace! Ohhh, my goodness. How do you ever go about choosing a favorite off Lisa’s website? I love them all! But I would have to choose between: True Love Hearts necklace or the Together necklace. I subscribe to you in my reader! I’d love to have the Vintage Frames necklace! Boy, it is hard to narrow my wishlist down; but I got it down to two items…. The Illuminate Necklace or the Aquastone Necklace. I would get a necklace or bracelet with my children’s names on it. My favorite is the “whooo do you love?” necklace, although that snowflake ornament caught my eye! I would put it towards the Brave Love necklace. I like the Banner Bracelet. I have a 6 year old who would love the petite original necklace. I want them all, but I would probably start with the key to my heart necklace. The baby spoon ad snowflake ornament. I love the hope is the thing necklace! I follow you on twitter and twitted this! I follow you n facebook! The cream freshwater pearl earrings. I love the heartstrings necklace…perfect for my three daughters! Beautiful stuff! I would choose the ‘Brave Love’ necklace! The daisy charm bracelet is nice. I LOVE the laundry line necklace!!! I just love the Grow Roots Sprout Wings necklace. I follow Balancing Beauty & Bedlam on Facebook. I just love the whimsy of the daisy chain bracelet…thats what i would get if i won. I would probably get the daisy chain bracelet! It is super cute! Lots of really neat stuff! I am going to have to go back and take another look! I see several that I like – not sure which one. I love the family necklace! I actually have received several of Lisa’s pieces as presents and totally love them! i love lisa leonard designs! especially her “i am loved” necklace. I would get either the teeny tiny initials or the itty bitty hearts. Sooo cute! I liked Balancing Beauty and Bedlam on Facebook. I love the “beautiful” necklace! I would LOOOOVE the Heartsting Necklace! This girl is talented! I’d pick a sterling ring… simple, beautiful, and timeless. I would choose a necklace with my children’s names on it. I love Lisa Leonard! I like the Brave Love and the Tinie Tiny Initials necklaces the best!! I would like the snowflake ornament. I like the connect and create bracelet. Love the Be Still or Through My Lens necklaces! I love the connect and create bracelet; great for my 7 kids. Would definitely get this! I would put the $50 towards the open circle bracelet! I would love the aqua stone necklace or the heartstrings necklace! I like the itty bitty hearts necklace with the initials. So cute! I really like the Family Tree Necklace, as well as the Snowflake Ornament!! I Love the Family Tree Neclace I would Spend it on that. I love the hope is the thing necklace. Thanks. i like the heartstrings necklace and i would probably add a couple of small charms and birthstones, then give it to my daughter-in-law. I would love the petite family crest necklace. It is just so pretty. I am a friend of BB and B.
I like the Forever necklace and the daisy bracelet!! Great give-a-way, thanks!! I like the key chain or the wallet. I seen so many nice items. I am your FB friend. The banner bracelet is awesome! the family tree necklace is beautiful! I like the sea star or heartstrings necklaces! I would use the gift card on the teenie tiny initials necklace if I won this giveaway. It’s so precious! The banner bracelet is my fav.! i like ya on facebook! I’d get the snowflake ornamant.